Do You Need to Forgive Your Teenage Self? Shortly after getting married, my husband and I moved into a tiny one-bedroom apartment—our first little home together. I was beyond excited for this new season, you know, the one that most of us ladies thrive in—nesting. I spent hours pinning and pondering ways to style three different neutral colored hand-me-down couches so that our home did not look like a thrift store. I also wanted to find ways to bring life to our plain white walls. Maybe curating a home is supposed to be a short season, where one fits all the puzzle pieces of furniture and accessories together, but I’ve learned that we can’t expect to open our front doors like the front page of a Pottery Barn catalog to see flawlessness on demand. So, I’ve come to live by a few things in this time of styling our apartment (since I am quite capable of making myself crazy when it comes to home goods). 1. Love where you’re at and who you’re with. Our spaces do not have to come together in a day, and likely won’t. What happens in our homes and hearts is far more important than what sits on the shelves and hangs on the walls. Let’s appreciate the details that have come together and remember that the people in our homes are far more worthy of our efforts than filling empty spaces. We can still have a much needed heart-to-heart on an ugly couch. We can pull a great book out of a cardboard box, and we can still get a good night’s sleep without an upholstered headboard. Side note: Married ladies, include your man in the process. Ask him what he likes, instead of assuming he doesn’t care. Let him know your plans even if a big purchase is far away. If he’s like mine, his opinions are minimal but he really appreciates the thought, especially if he deals with the finances. What happens in our homes and hearts is far more important than what sits on the shelves and hangs on the walls. 2. Wait and save. Think through it; do you need it right now? Need is up to your interpretation (haha). Or better yet, can you make it yourself? If you know you shouldn’t buy it right now but would like that specific item, wait for a sale, sign up for emails or keep checking back. Right off the top of my head, I can think of about $600 in savings on three big items in our home because I decided to wait and took advantage of sales. However, if you can afford it without going into debt, go for it! 3. If you’re not sure about something, don’t buy it! I even had a lady in HomeGoods tell me this a few weeks ago as a stared at planters for—well—long enough to make a stranger notice. Yes, it is frustrating to come home and realize that the ottoman would have been perfect for that chair and now you have to go back to Target (which then makes you feel better because you have an excuse to go back, haha… guilty). However, it is more annoying to buy a rug just because it’s cheap and then make your husband lift the kitchen table to quickly realize, or rather remember, that it’s not actually what you wanted… Don’t settle for something just because it’s cheap. Reminder: nothing has to get done today. 4. Returns are allowed! Time to keep track of those receipts! I’m so guilty of buying and returning an item multiple times, however, I’m much more pleased with our spaces after finally getting the perfect pieces. Don’t settle for something just because it’s cheap. 5. Make up the rules. It’s your home. If the artwork on the wall isn’t arranged in the way the eye should follow it (by a designer’s standard), that’s okay, as long as you love each piece exactly where it hangs. You don’t have to follow any design rules if you don’t care to! I know, crazy talk. This includes buying quirky items you’re sure anyone else would find “weird”… There is a ceramic sheep on our TV stand… And a pig. 6. Ask for help. Call on that artsy friend! People who are passionate about design and art love to give advice when it comes to putting together a space for someone to feel most comfortable and themselves. 7. Stop comparing your home to others’ homes. Let Pinterest and others inspire you, not tell you what you have to do. I don’t think there is a topic in life where a gentle reminder to stop comparing ourselves to others isn’t necessary. Each of our homes uniquely shows those who spend time in them who we are and what we love. Let us appreciate coming together in each other’s unique living spaces and share our great ideas with each other! I’ll end my hopefully helpful thoughts with some of my favorite places to score on home goods. The majority of my home is brought to you by World Market, HomeGoods and of course, Target. I typically get inspiration or wait for sales in West Elm, Pottery Barn, and Anthropolgie. What pieces make your home a happy place (besides the people of course!)? 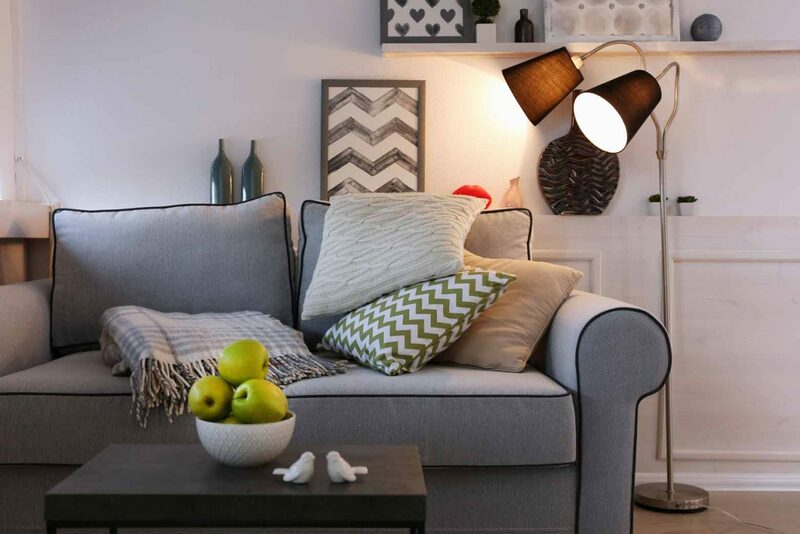 Feel free to share a great score-on-homegoods story! You’ll also like The Key to Waiting, Super Easy Housecleaning Tips, and How to Fake a Clean House.